The noise scene has always been the ultimate underground for music producers. No other genre has this ammount of variation, techniques and instrumentation as noise. Besides, there's not really a 'noise-country', even though Japan would be a decent candidate. But noise is made everywhere, from the tiniest bedroom to the biggest recording studio, people are experimenting with sound in all forms. Most noise-artists and labels have a solid Do-it-yourself attitude, printing CDRs or tapes and wrap them in a self-made cardboard cover. So is this release, a limited edition C-20 tape with four tracks, released by the DIY-label Fall Into Void Records. Josef Nadek hails from Tyrol, a federal state in western Austria. He has been making noise music since 2009. Several tracks were relea'se on compilations from all over the world. However, Bluatig Hårt isn't just a noise album. Only 's wilde Gfåhr' can truly qualify as a noise track. It has no rhymth, no song structure and no common instrumentation. Basically it's just feedback, reverb and noise, to be enjoyed by experienced listeners only. The other tracks are mainly ambient tracks with an industrial touch. The basic theme on this album is Tyrolean folklore. Personally, I don't really know what to expect since I can only imagine people in lederhosen, dancing to some sort of polka. Yet, the music we hear on this e.p. builds landscapes of endless snowy mountaintops, quiet streams and the sounds of nature. At least, that's the opener 'Wåldgeischta'. 'Nimma då' sounds a bit more mechanical and cold, reminding me of industrial ambient acts like Cisfinitum. Closer 'D' Bluatig'n' delves into the dark ambient style again, becoming the creepiest track on this album (mainly because of the eerie vocal-sounding sounds). In all Bluatig Hårt is an excellent dark ambient album with three very good tracks and a noise track that not anyone will appreciate. Together however, they form a gloomy and grisly presentation of what lurks in the vast, dark forests of Tirol. 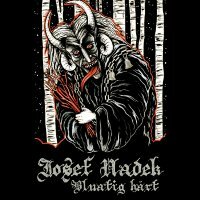 With four tracks that are quite different from each other, Josef Nadek has recorded an interesting e.p., a recommendation for fans of all things creepy.